“Crises offer the opportunity to implement policies that lead to profound political and economic changes on the fast track as societies are in turmoil and unable to organise themselves against these implementations. Naomi Klein (2007) explains in her book, “The Shock Doctrine”, how proponents of neoliberalism unable to convince people by means of argument, use situations of shock such as coups d’état, dictatorships or natural disasters to proliferate neoliberal policies. These entail a stripping of the welfare state and general public services as well as the privatisation of public assets. Rather than “free economies” going hand in hand with democratic societies, as it often tends to be represented, the “liberalisation” of economies historically depended on the shocking of populations through extreme state violence and terror or the seizing of opportunities that had an equally traumatising and paralysing effect on civil society. Naomi Klein shows through a rich array of case studies of the last 50 years how neoliberal policies are incompatible with constitutional democracy if no repressive measures are taken against the own population. Neoliberalism was tested first as an experiment in Pinochet’s dictatorship in Chile where the population was held in check through widespread torture and disappearances. After the experiment was repeated in other military dictatorships like the Argentinean junta, Margaret Thatcher’s Great Britain became the first Western democracy that adopted neoliberal policies. After initially dismissing neoliberalism as “incompatible with constitutional democracy”, she created domestic conditions that enabled her to push forward with the neoliberal agenda at home. These conditions were created through the Falkland War abroad and a violent suppression of unions at home. In Thatcher’s Great Britain, downsizing of the welfare state and far-reaching privatisation programs came along with the curtailment of labour and demonstration rights and an increase in repressive measures. Such developments can also be observed in Spain and Greece today. In direct resemblance to Thatcher’s TINA (“There is no alternative”) narrative, the media and politicians of both Spain and Greece adopt a discourse of “we have lived beyond our means and now we have to cut back, there is nothing we can do about it, we have to cut social services and privatise in the name of fiscal balancing” (Reich, 2013). One of the main objectives of the Shock Doctrine, as explained by Klein (2007), is to sweep away autonomous narratives and inoculate people with fear to diverge from the prescribed plan of action; in other words, to create an experiential understanding that there really is no alternative to what the central powers say and do. Similarly, David Graeber interprets neoliberalism less as an economic program than a political program “designed to produce hopelessness and kill any future alternatives” (Graeber & Solnit, 2012). It is thus telling that the Greek mass media create horror scenarios of what happens if the congress does not pass Troika’s austerity memoranda. “Economic experts” literally tell the Greek people on national TV that “there will be chaos. Greece will become a Third World Country. The supermarket shelves will soon be empty. There will be ration coupons” (Chatzistefanou & Kitidi, 2012). Similarly, a special “Citizen Security Law” is crafted in Spain to quell the new forms of citizen protests and politics that defy the austerity programs, create autonomous narratives and form the Spanish indignado movement (Fernandez-Savater & Martin, 2014). These anti-protest laws take such repressive measures as criminalizing passive resistance, uploading police violence on Youtube or Tweeting about a protest which can be punishable by fines as high as 600,000€ (The Guardian, 2013). Members of the indignado movement identified the objective of these laws as an attempt “to proscribe politics by criminalizing it, and withdrawing anything other than politics by politicians from circulation” (Fernandez-Savater & Martin, 2014). It is thus directly aimed at the citizenry’s capability to create their own narratives and to make sense of the events around them without having to rely on the information propagated by the political elite and the mass media. While civil society is educated towards learned helplessness, a psychological state in which there is no more perceived capability to effect changes on the personal environment and complete submission to any external changes that are inflicted on the person, comprehensive privatisation programs transform public goods into private wealth (Soy Publica, 2014). Before the privatisation program in Greece could begin, however, the necessary governmental positions needed to be staffed by the appropriate personnel favourable to the plans. When former Prime Minister George Papandreou stepped down from his post in 2011 due to vehement popular opposition to the conditions of the Troika’s bailout plan, he made way for the former Vice President of the European Central Bank, Lucas Papademos, to lead the new interim-government until elections in 2012 (The Guardian, 2011). Papademos then staffed governmental positions with people from the private Greek Bank Eurobank which made negotiations with the Troika essentially into an interbank deal (Chatzistefanou & Kitidi, 2012). It is important to note that this interim government had no democratic legitimacy while passing comprehensive austerity and privatisation bills that would shape the country’s future for years to come. In the light of the massive vocal opposition to the neoliberal policies passed, this interim government can be viewed as a direct cancellation of democracy where sovereignty is given to experts from the banking sector. One Greek citizen summarizes the feeling of the time in the Greek documentary Catastroika: “The political system we have now in Greece resembles that of a junta. It is a banker’s junta with no more popular legitimation than the 1967 junta” (ibid.). In order to facilitate a speedy privatisation process, the Greek privatisation fund “Hellenic Republic Asset Development Fund” (commonly known under the Greek acronym TAIPED) has been founded to undertake the most extensive privatisation program ever implemented in an EU country (Mavroudi, 2013). The stated mission of the private fund is “to restrict governmental intervention in the privatisation process” (TAIPED, 2014). Public assets ranging from islands to public utility companies and motorways are handed over in escrow to the fund for it to be sold off to private bidders. A special law prohibits assets once handed over to be given back to the state, and the Greek public sector has legally withdrawn from any financial claim over revenues which are committed to go towards debt-service (Mavroudi, 2013). Only two out of the six board members are approved by a parliamentary committee and there are a range of international experts and observers from the Troika advising the fund. Critical observers argue that the Greek privatisation process resembles that of occupied countries where external agents come to the country, run the sell-off of the country’s assets, while the costs of the whole operation are carried by the local population whereas the profits which are expected to amount to 50 billion Euros go to the creditors (Chatzistefanou & Kitidi, 2012). It is a large scale transfer of public wealth into private property outside of any democratic control. Crises do not only cause material hardship and an opportunity for the powerful to privatise public wealth, but they can also spur the fast building of communities and a sense of solidarity between those who are affected by it. Rebecca Solnit (2009) provides in her book A Paradise Built in Hell: The Extraordinary Communities that Arise in Disaster a rich array of case studies where people came together as a response to natural disasters in order to help each other through the difficult times. From earthquakes in San Francisco and Mexico City to floods in New Orleans and the terrorist attacks of 9/11, what Solnit found time and again was that in these times of external disruptions to social life, people who usually lived individuated lives suddenly came together for cooperative disaster relief. On the ground, people were there for each other, helping their neighbours and fellow citizens who they mostly did not know, and people reported a great sense of belonging and solidarity. At the same time, individuals respond emotionally in surprising ways: rather than being overwhelmed by fear and confusion, they report an intense joy of working together for a greater cause, and of getting intimate with people instantly who lived in their vicinity for years without ever having personally interacted with them. Furthermore, as external structures and institutions break down and individuals respond to them in cooperation with others, they start to feel in control of their own lives again; they feel to have more power and agency than in their uninterrupted everyday lives. Solnit describes this spirit of mutual aid always in great contrast to the response of the central powers – governments – who often militarise disaster zones expecting people to behave in savage Hobbesian ways as “the social order” is expected to break down through the external havoc. The only way the prevailing social order breaks down however, is in the sense that people stop relying on external institutions and start taking responsibility for their own lives by interacting in spontaneously emerging decentralised networks for dispersed decision making. Solnit recognises how threatening disasters are for political elites as power is being devolved to people on the ground as they are the first responders who assemble impromptu kitchens and networks to rebuild their neighbourhoods. She argues that centralised powers are structurally incapable of dealing with such situations and that “only the dispersed force of countless people making countless decision is adequate to a major crisis” (Solnit, 2009, p. 305). “Economies are inherently cultural. The way things are produced, distributed and consumed is strongly shaped through cultural norms and practices (Zelizer, 2011). When there is a systemic crisis, this indicates also a cultural crisis: the existence of certain values as the guiding principles of human behaviour that are non-sustainable (Aitken, 2007; Akerloff & Shiller, 2010). Thus, the transition towards a new sustainable economy based on social and environmental values is strongly dependent on a fundamental cultural change if we are not to wait on external resource pressures that force us in that direction (Nolan, 2009). It may very well be that we are currently in such a period of cultural transition. Since culture is a material practice, it should be possible to observe signs of new protocultural forms in the spontaneous adaptation of peoples’ lives to the constraints and opportunities arising from the crisis. This dissertation investigates new economic practices as an indication of such a cultural transition. The financial crisis has been brought about through a combination of deregulation and individualism as a way of life which manifested in corporate managers focused on their own shortterm profits as the guiding principle of their increasingly risky decisions (Tett, 2009; Zaloom, 2006). The “me first” culture is a key-ingredient of business management, manifested in the self-interested, rational, utility-maximising “homo economicus” (Sennett, 2006; Moran, 2009). This culture can be designated as “networked self-interest” (Cardoso & Jacobetty, 2012). On the other hand, across the world, there are movements of protesters that condemn this “me-first” culture in economic and political networks of power and the results it has brought about. Gustavo Cardoso and Pedro Jacobetty (2012) research the culture of these oppositional movements and argue that although we live in a network society under network individualism, an underlying cultural shift is taking place towards the adoption of a paradigm less centred on self-interest and more on the ability to adopt common interests and belong to a group that shares objectives within a given network. Such a cultural transition is fuelled by a change in values and belief in cooperation, free sharing, transparency, and open source production. Cardoso and Jacobetty identify these traits in the political and economic movements for social change and term them “cultures of networked belonging”. A description that I find very appropriate as a sense of belonging is one of the most valuable features that these networks offer to their participants. The sense of belonging to a wider movement, contributing to a bigger cause, to be looked after and to be able to care for other people are some of the most valuable psychological support mechanisms that save its participants through the time of crisis. This has always been the case with catastrophes as Rebecca Solnit (2009) makes abundantly clear in her book A Paradise Made in Hell, but the difference with the support systems that flourish in this particular crisis is that they are created to stay on afterwards and continue to provide these benefits as they embody exactly the social change that people are aiming for. 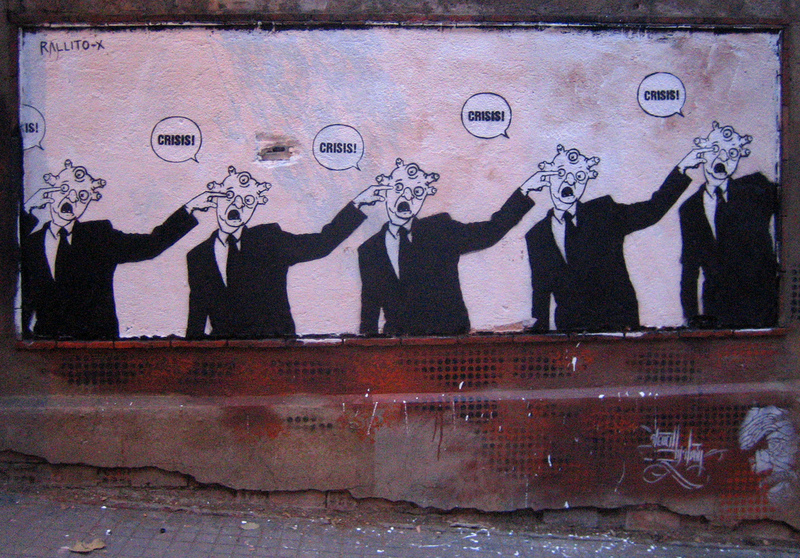 As one writing on a wall in Madrid puts it: “Nothing would be worse than getting back to ‘normal’” (Biliris, 2012). The crisis creates a profound cultural challenge for many as it throws them into an identity crisis as consumers (Chatzidakis, 2014). Since the crisis leads to a severe drop in income for many people who are also not able anymore to consume on the basis of credit as they used to for the last decade, large parts of the Southern European population find themselves in a position where they cannot consume as much as they used to and would like to. Some try desperately to revive consumer fantasies by visiting gifting bazaars or paying small deposits in stores to reserve items, pretending not to know that it is no longer possible for them to return and buy them (ibid.). Others try to find fulfilment in something else than consumption and in order to do so need to change their values and generate from within a new culture in order to overcome consumerism (Castells, Caraca & Cardoso, 2012). Since new values do not generate in a vacuum, this non-consumerist culture may only grow on the basis of actual social practices that exist in societies around the world, often first enacted by drop-outs of the current economy because of their rejection of what they consider to be a destructive way of life (ibid.). The rise of a new economic culture may thus result from the historical convergence between a cultural vanguard searching for a different way of life, and the disoriented masses of ex-consumers who no longer have the opportunity to consume anything but themselves – “people who have nothing to lose but their cancelled credit cards” (ibid., p. 12). In this light, they need to make the shift Erich Fromm (1976) advocated almost 40 years ago “from having to being”. In the context of the crisis, the identity of an affected person framed through “having” is likely to be that of a “defective and disqualified consumer” for whom “non-shopping is the jarring and festering stigma of a life un-fulfilled” (Bauman, 2011). To create a dignified identity in this new context, it thus remains the frame of “being” which places greater emphasis on a person’s relationships, belonging and processes someone is involved in (Fromm, 1976). The alternative economic practices that currently proliferate in Southern Europe’s crisis-ridden societies offer exactly this kind of identity-creation through practical affiliation. A Catalan research group, including the eminent sociologist Manuel Castells, conducted an empirical research project to study the universe of conscious alternative economic practices in Catalonia (Conill et al., 2012). On basis of seventy filmed interviews of individuals involved in such networks and organisations, the research group created the documentary film “Homage to Catalonia II” which subsequently was used to stimulate debate in eight focus groups. From this qualitative research, a questionnaire was created which was used to conduct 800 interviews with a statistically representative sample of the population of Barcelona. The survey tried to measure the extent of diffusion of each one of the identified alternative economic practices in society at large, and determine the factors inducing or restraining the diffusion of these practices during the economic crisis. To be sure, economic activities that do not fit within the pattern structured by the rules of the capitalist market permeate throughout the entire society, and society only functions because everybody performs every day countless acts of generosity that defy market logic (Graeber, 2011). In some cases, however, there is a deliberate attempt to connect these practices to an alternative vision of how social interaction and especially economic activities should be organised (Conill et al., 2012). The research team attempts to map the diffusion of these conscious non-capitalist practices in Catalonia and has categorised the diverse activities in a typology that is displayed in Figure 1. The researchers have found that alternative economic practices have grown considerably since the onset of the crisis, but are due to their methodological setup – a one-time survey and not a longitudinal study – not able to quantify this growth (Conill et al., 2012). Nonetheless, one remarkable quantitative finding is that 97% of the surveyed people have engaged in some kind of non-capitalist economic practice since the start of the crisis 2008. The fact that virtually every participant of the representative sample of Barcelona’s population is engaged to some degree with these practices shows that there is a strong resonance between a conscious alternative economic culture and the culture of a mainstream society shaken by the economic crisis. While everybody, regardless in how intensely they are involved in alternative economic practices, is fully aware of the severity of the economic crisis, people differ widely in their perception and evaluation of the crisis. The first group, which the research team terms “culturally transformative” feels reaffirmed in their analysis and rejection of a consumerist lifestyle and feels vindicated to have set up an alternative way of life before the crisis hit. They position themselves ideologically and aim for social change that treats the root causes of the crisis rather than adapting to its effects. For the second group, who the researchers term “alternative practitioners”, the crisis has shaken their beliefs and their understanding of life. It affects everything they used to do or think, so that adapting to the new environment is difficult and confusing. In order to get by in these hard times, they change their practices: they consume less, they share and barter, they participate in solidarity networks and a number of other practices that help them to deal with the economic unpredictability in which they currently find themselves, but often without knowing exactly why, how and for what kind of future. While the practice of the first group is mostly value-driven, the motivation of the second group to engage with such alternative economic practices tends to be to meet their needs in a new way as old patterns do not suffice anymore. While the culturally transformatives had anticipated the crisis, the alternative practitioners are reacting only now and are learning by doing, slowly discovering a new world of alternative economic practices through gradual involvement. In contrast, the third group that the researchers term “culturally adapted” are unable or unwilling to accept the new circumstances, are waiting, enduring the hard times, and hoping for the best, which is often vocalised as a return to the ‘normal’ pre-crisis conditions. The research team speculates that as the crisis deepens, the shift from being culturally adapted to becoming alternative practitioners may be one of the most decisive trends in ongoing social change (Conill et al., 2012).